A good starting hole for the challenging back nine. 60-yard wide landing area. Second shot is slightly uphill and large bunker guards right side of green. Back right pin placement will be one of the toughest. 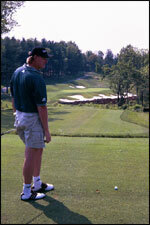 Course Designer Ernie Els looking over the par 3 11th hole. A spectacular par 3 and one of the signature holes. It starts a stretch of holes carved out of a pine forest. Rock wall creates the face of a bunker that runs the length of the 30-yard green. Green is long and narrow, running away from the player. The longest and most demanding par 4 on the golf course. Requires a 180 tee shot over a deep ravine from championship tee to reach fairway. Mounding on right side of the fairway should force errant tee shots back into the fairway. Second shot requires the player to carry a wetland area to reach green. Players will have a secluded feeling playing this hole as large, fifteen-foot high mounds frame the right side of the hole. Small fairway pot bunker is located on left side of fairway. Tall pine trees create a backdrop for the green. Another elevated tee shot that provides panoramic views of the surrounding mountain ranges and golf course. Whiskey Creek Canal guards the left side of the fairway. A small fairway bunker on the left side faces the player on the tee and serves as an aiming guide. Green is guarded by water on the left and a bunker. Small mounds on the right should push errant second shots back onto the green. The longest par 3 on the golf course. 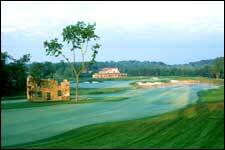 Playing from the championship tees will require shot to carry entire left side of the Whiskey Creek Pond. Front of green is protected by a large bunker. Shots going over the green will come to rest in a grass bunker. Relatively straight par 5 with elevated green visible from the tees. Fairway bunkers guard both sides of the fairway near landing area. Very difficult green to reach in two shots not only because of the length of the hole, but also because of the elevated, well bunkered green complex. The green is best suited to accept a high, lofted shot. Another generous landing area for a tee shot. Second shot is the most demanding of all the par 4's on the course, an uphill shot to a two-tiered green. Back pin placement will be one of the most difficult to reach. Two large and deep bunkers guard the left side of the green. Golf Magazine put it best in the April 2000 issue, "a spectacular finishing hole". The 18th hole at Whiskey Creek is possibly one of the most dramatic and unique finishing holes in the Mid-Atlantic. With the ruins of 19th century stone house once belonging to German immigrants standing in the middle of the fairway 275 yards from the championship tees, this down hill par 5 offers many strategic choices to the player. Playing to the left side of the fairway off the tee will provide the bold player with an opportunity to go for the green in two. Playing to the right side of the fairway off the tee is the safer route, although the third shot must be played over a small pond guarding the green.